Place all of the ingredients into a saucepan. Fill the empty tomato tin with water and add that also. Bring to the boil, on a gentle heat, and simmer for 20 minutes until thickened, adding a little more water if it starts to stick to the pan. Pour into a blender and blitz to a purée. Adjust the seasoning and set aside. This will probably make more sauce than you need – you can freeze any leftover sauce or add to pasta. Place the flour, yeast, salt, oil and sugar in a large mixing bowl. Slowly add enough water to make a soft dough. (This is a lot easier in an electric mixer with a dough hook. Knead the dough on a lightly floured board for a good 10 minutes(or 5 in the mixer)until it is smooth and elastic. Place into a lightly oiled bowl and cover with cling film. Leave in a warm place for about an hour until it has doubled in size. Preheat the oven to its highest setting. If you have a pizza stone, place that into the oven to heat up. If you don't have a stone then place a large baking tray or pizza tray on the top shelf of the oven. Take two pieces of baking parchment, large enough to fit a 30cm pizza on. Heat a drizzle of oil in a large frying pan and add the garlic. Cook gently for a couple of minutes. Place the dough on a lightly floured board and knead again to knock out the air bubbles. Divide it in half and roll into two balls. Sprinkle each generously with the cornmeal. Either roll out each ball into a large circle about 30cm diameter or press the edges out using your fingers, stretching the dough as you go. Place the dough onto the parchment. Spoon a ladleful of the tomato sauce onto each pizza and spread out thinly. Sprinkle over most of the cheese and then divide the jalapeños and pepperoni between the two pizzas. Add the garlic and then top with the remaining cheese. With the help of a large, flat tray, quickly pull the pizzas onto the tray and then slide it into the oven- one at a time. Bake for 6-7 minutes until golden and bubbling. 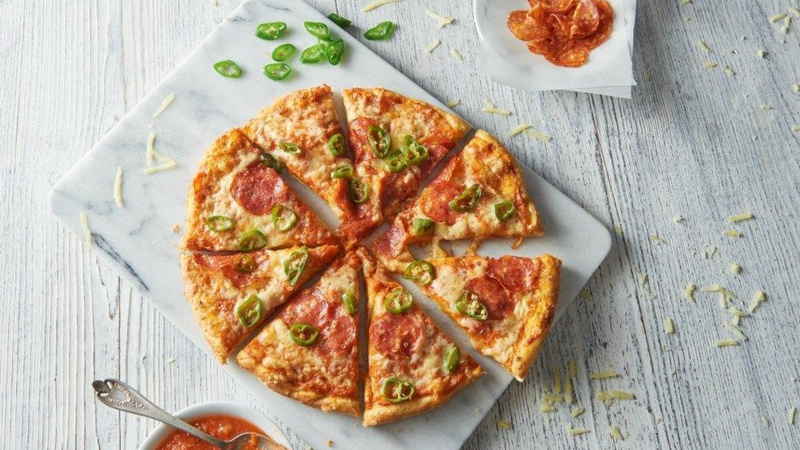 Divide into slices using a pizza wheel and serve straight away. and pepperoni between the two pizzas. Add the garlic and then top with the remaining cheese. With the help of a large, flat tray, quickly pull the pizzas onto the tray and then slide it into the oven, one at a time. Bake for 6-7 minutes until golden and bubbling.